Oceans and space are two dimensions still largely unknown which represent both our origins and future. In his new movie "Oceans" French filmmaker Jacques Perrin teamed up with the European Space Agency to reveal the deepest secrets of the big blue: from the beauty of its creatures to mankind destruction of it. Indeed space truly plays a key part in the "Oceans". Three quarters of the earth's surface is covered with water and thanks to satellites, that Jacques Perrin calls the "divine balcony", we now have a better understanding of the oceans that could help manage climate changes affecting our planet. Speed at 10 knots in the middle of a hunting tuna shoal, accompany the dolphins as they frolic, swim shoulder to fin with a great white shark—watching the film "Oceans" is like being a fish among fish. Following on from "Microcosmos", "Himalaya" and "Winged Migration", Jacques Perrin uses brand new filming methods to take us from the polar ice floes to the tropics, to plunge us into the heart of the oceans and their storms to discover well-known, little-known and unknown sea creatures. The world’s first hydrogen-powered yacht will be used to study pollution in the Mediterranean. The Zero Co2 project uses a clean carbon-free auxiliary motor. The 12-meter craft built is equipped with an electric motor driven by a hydrogen fuel cell. It is also equipped with renewable energy power sources (solar, wind, and hydro) to generate power for onboard requirements. The yacht will travel around the Mediterranean coast as far as Turkey on a journey that will commence in March, 2010. The journey will also serve as a venue for the carrying out of research into the possibility of producing “green hydrogen” through the installation of solar panels and wind turbines on the roofs of port-side buildings. A scientific platform will be used to collect scientific data on man-made pollution throughout the length of what is estimated to be a 10-month trip. The onboard laboratory will analyze air, sea, and port sediments to evaluate the pollution from the sea and coastline. The key aim of the project is to develop and promote new energy sources to replace fossil fuels and to lead to a reduction in carbon emissions and the mitigation of the greenhouse effects. The Zero CO2 journey should open up amateur and professional sailors to new ways of enjoying the sea, using cutting-edge technologies that are both more respectful of the environment and more economic in terms of energy consumption. President Barack Obama announced plans on Wednesday for an expansion of U.S. offshore oil and gas drilling in an effort to win Republican support for new proposals to fight climate change. Shaking up years of energy policy and his own environmental backers, Obama threw open a huge swath of East Coast waters and other protected areas in the Gulf of Mexico and Alaska to drilling, widening the politically explosive hunt for more homegrown oil and gas. Obama's move allows drilling from Delaware to central Florida, plus the northern waters of Alaska, and exploration could begin 50 miles off the coast of Virginia by 2012. He also wants Congress to lift a drilling ban in the oil-rich eastern Gulf of Mexico, 125 miles from Florida beaches. Still off limits: the entire Pacific seaboard. And in a nod to conservation, Obama canceled oil exploration in Alaska's Bristol Bay, deeming the area a national treasure, while "studying and protecting sensitive areas in the Arctic." Expanded offshore drilling could put the US coastal states at risk from oil spills, threatening fisheries, tourism. It's clear that some interests are aggressively pursuing an effort to open the nation's coasts and oceans for unfettered access to oil and gas drilling. The Energy Information Administration, part of the Department of Energy, has reported that oil and gas drilling on the Pacific and Atlantic coasts and in the Gulf of Mexico wouldn't have a significant impact on U.S. oil and natural gas prices until 2030. The best way to lower oil prices for supporters of environmental protection is through energy efficiency and conservation. The vast majority of the world's climate scientists agree that sharp reductions of heat-trapping gases will be needed globally to improve the odds of avoiding dangerous climate shifts and this decision will clearly not help in terms of climate bill. To help racing sailors get familiar with the new Racing Rules of Sailing, UK-Halsey Sailmakers presents a series of animated race course incidents on its website. The objective is to have the viewer follow the action, determine what rule or rules apply and finally decide who (if anyone) was right or wrong. The quizzes are based on common situations when sailboats come together on the race course. The questions are not about obscure, hard to repeat, situations; they present incidents that happen again and again on the race course. Since most of the quizzes have several related questions, the library of quizzes offers a lot of sail boat racing lessons. What makes UK-Halsey's quizzes a unique way to learn the rules of sailing is the use of animation, which allows viewers to get a much better understanding of the rule in question. The animations can be stopped and started and played over as many times as necessary for the viewer to come to their own conclusion before checking the answer. Viewers watch the boats move; spinnakers go up and come down; sails luff and are trimmed as well as move from side to side as the boats go around the racing marks. Hot links are embedded in the answers when a rule or rule book defined term is mentioned so that the text of the rule or definition can be brought up in a separate window as a reference. The answers are presented in the same format a protest committee would publish a decision: first the facts found are presented followed the rule or rules broken, followed by the decision of who was at fault. All the quizzes are free, but to see the answers, viewers must create a login with the UK-Halsey site. Bob Couttie's Maritime Accident Casebook resumes : "An exhausted Captain; single watch-keeping; a warm, cozy bridge at night; the heavy traffic of the Kiel Canal, and pirated navigational software. If you think that sounds like a recipe for disaster, you’d be absolutely right." More serious than the lack of radar expertise among the crew, in the context of this accident, was the confusion of the pilot and the ship’s master over the symbology used by the electronic chart system. The electronic chart system in use on the Cosco Busan was not a full ECDIS system, as it was operating with unofficial chart data, though the hardware itself was capable of performing as an ECDIS. 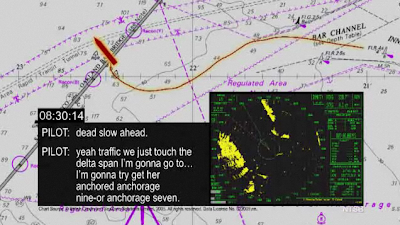 However, NTSB does note in its report that the symbols upon which the pilot relied for navigation were “similar, if not identical” to the type of symbols approved in the International Hydrographic Organization’s (IHO’s) Presentation Library for ECDIS. The report continues with details of discussions of these symbols that took place between the master and pilot, recorded by the VDR. It says: “the pilot asked the master about the ‘red triangles’ - as he referred to them - on the electronic chart display of the vessel’s transit area. This confusion and uncertainty in the use of the navigation equipment aboard the Cosco Busan had disastrous consequences, as the containership struck the base of the bridge’s Delta tower and leaked approximately 53,500 gallons of fuel oil into San Francisco Bay. Well, the Cosco Busan verdict has asked the company concerned to spend more on training on voyage planning and Ecdis. In addition, it was also ordered to implement a comprehensive compliance plan that would include heightened training and voyage planning for ships engaged in trade in the United States. The total number of incidents attributed to the Somali pirates stands at 217 with 47 vessels hijacked and 867 crew members taken hostage. Somalia accounts for more than half of the 2009 figures, with the attacks continuing to remain opportunistic in nature. 2009 has however seen a significant shift in the area of attacks off Somalia. While the 2008 attacks were predominantly focused in the Gulf of Aden, 2009 has witnessed more vessels also being targeted along the east coast of Somalia. 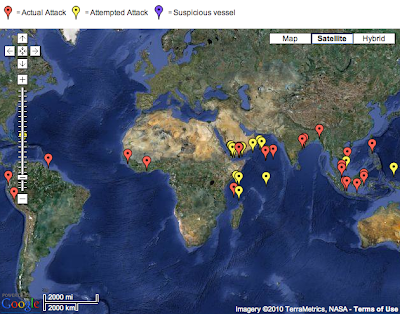 Since October increased activity has been observed in the Indian Ocean with 33 incidents reported, including 13 hijackings. Thirteen of these last quarter incidents occurred east of the recommended east of 60° east – including four hijacked vessels. Many of these attacks have occurred at distances of approximately 1000 nautical miles off Mogadishu. "A systematic inventory of maps in The Adventures of Tintin has still to be be done, but, surprising though it might seem, the reporter and globetrotter does not use maps very often. Take just one example : the Red Rackham’s Treasure album, that Steven Spielberg is adapting for the cinema. No map is shown in the book, if we don’t count the globe at the very end of the album (see below). The story is, nevertheless, fully geographical. When Haddock and Tintin ship out in search of Red Rackham’s treasure, they have two clues: a pair of geographic coordinates and a mysterious reference to “The Cross of the Eagle”. And their journey on the Sirius begins with a localization error. Tintin finally understands that the coordinates provided by the ancestor of the Captain, the Knight of Hadoque, were calculated in reference to the Paris and not the Greenwich Meridian, which became the official international reference in October 1884, after a long French resistance for imposing the Paris Meridian. Knowing that the Paris Meridian is located 2° 20‘ 16” further east than the Greenwich Meridian, we see that the Island is located at 20° 37′ 42″ North latitude, 68° 31‘ 59” West longitude. Actually to be exact 2° 20' 16.0058" is the offset with ED50 European Datum 1950. The right value is 2° 20' 11.4874" with RGF93 French Geodesic Network (very closed to WGS84). This episode is often used by teachers as a geometry exercise (example). Nowadays we simply enter these coordinates into Marine GeoGarage (20.628333/-68.534444, longitude as a negative digital number, since we are located west of the Greenwich Meridian) and we observe that the wreck of the Unicorn is located near Saint-Domingue’s coast. If you have Google Earth on your computer, you can also use this kmz file (spiced up with a little surprise picture). Note that Hergé placed the island not far from the shoals of Navidad Bank and Silver Bank, famous places for the number of ancient shipwrecks. This episode confirms the well-known fact that Hergé’s creation was a well-researched and a very documented process, at last since The Blue Lotus." But despite this realistic dimension, in a website written by another Tintin's fan, Nicolas Saborin pointed some approximation relative to geographic coordinates and globe representation. Actually, at page 61, this is a curious globe which stands at the feet of the statue of St. John the Evangelist. If the meridian of Greenwich (or Paris) is indeed well represented, we can also see the meridian 70° W (longitude of the wreck) and the meridian 50° E (eastern point of Africa). Some would rather have drawn meridians every 60°. A parallel is represented at the height of the middle of Spain, 40° N.
So finally, the point representing the wreckage is placed too high. Its latitude (20° N) should be halfway between the equator and the 40° N parallel. Of course !